To make up for missing two weeks, I here offer an extra-long post (fair warning!) recounting one of my Britain adventures. Ron and I happened upon a remarkable endeavor while visiting York last month, and I’m so glad we spotted the posters, plunked down our pounds sterling, and settled ourselves into tight seats on scaffolded risers for a three-and-a-half hour spectacle: the York Minster Mystery Plays. Not everyone would geek out, I realize, at the prospect of revived medieval theater. We are dealing here with a piece of history that—one might imagine—only a Brit-lit professor could love. Yet the show was running for 41 performances with space for 1000 people at each. So we were curious: Could a medieval Christian teaching tool be successfully adapted for a modern, secularized audience? 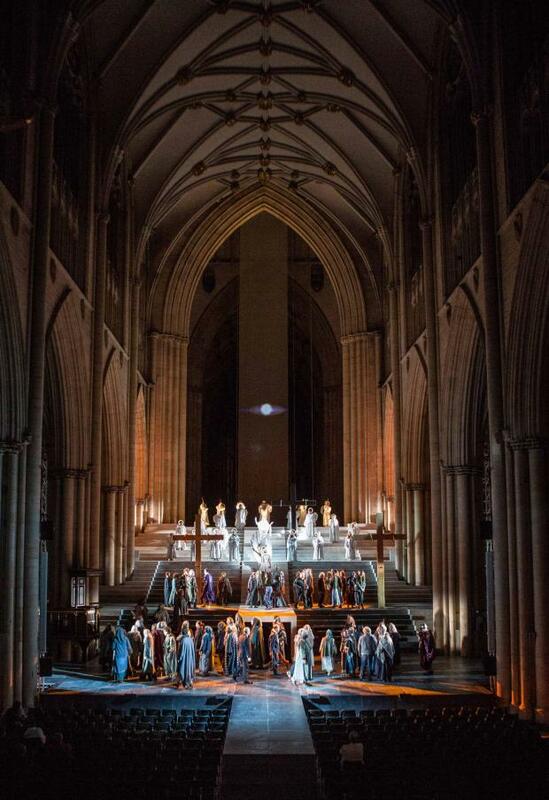 The York Mystery Plays date from the mid-fourteenth to mid-sixteenth centuries. Like a number of other English towns in this period, York had a tradition of staging a cycle of biblical stories to celebrate the feast of Corpus Christi in early summer. It was a full-on community festival, created and performed by ordinary folk. The trade and craft guilds each were responsible for financing and performing one playlet in a long cycle that told the whole biblical story, from the fall of Lucifer to the last judgement. The whole cycle was performed outdoors in a single day, with each episode carried about on its own “stage” in the form of a wheeled cart. The point of this medieval community theater feat was to educate the populace, yes, but it was also good fun. Each town had its own scripts, developed over generations, and they were full of slapstick humor, lively characterization, and poignant reflection on key biblical episodes. York’s script is among the most famous, partly because it survived complete: in one precious manuscript now preserved in the British Library. The Corpus Christi celebrations were suppressed after the Reformation, and the tradition lay dormant until the twentieth century. Since the 1950s, York has been experimenting with ways to revive the plays. In 2000, they staged a compressed version of the cycle right in the nave of the cathedral. Professionals modernized the script, directed, composed the music, and designed the production, but community amateurs did everything else: played all the roles (except Jesus), made the props, played the music, ushered audience members to their seats. This summer’s production was a revival of that ambitious experiment. And so Ron and I squeezed into our seats on the risers, the graceful arches of the nave ceiling fading into the early evening shadows above us and the Minster’s gorgeous East Window glowing gently before us. The stage was an elaborately built, tiered affair, rising from a flat platform below, up dozens of stairs, into the “heavens” beyond the last stair. Medieval cosmology, in other words, represented with stagecraft. The lights go down, and here comes God the Father, gold-masked, appearing on the very top step. God quickly establishes himself as unmade maker, merciful and full of blessings, then introduces the heavens and hell (wait—what? already?) and the ranks of angels, kitted out, as one would hope, in white robes, feathery wings, and battery-operated, glowy halos. Hell is a multi-purpose, square cave opening, a yawning darkness at the lowest level of the stage. We have to move fast here if we’re going to cover everything in less than four hours. So the next thing we know, God the Father honors the angel Lucifer as brightest among the angelic ranks, and Lucifer immediately glorifies his fabulous self, literally stepping in front of God the Father and obscuring the audience’s view. God condemns Lucifer for his pride. “I never did naught!” protests Lucifer, deploying the universe’s first equivocatory double negative. The other angels strip his wings, chuck him and his cronies out of heaven, and shove them into the hell cave. And we’re off! Next up: creation. And here’s where, as Ron remarked, we rejoice in the work of theater people who really know their s#*t. Designer Max Jones created a wondrous, gasp-inducing planet parade—great colorful balloons bobbing majestically into the nave, subtly lit from inside. A sort of divine Macy’s parade. Then come the animals: birds flitting about on long, flexible wires; galumphing creature-puppets; a sparkly, multi-section whale. Finally, God calls forth Adam and Eve, looking like the mud-creatures they are in camouflage-ish body stockings, Adam complete with a pretend dangly bit. They’re innocent and happy and as delighted with creation as we are. They give God the glory and they’re happy to obey. It’s a sweet moment. It doesn’t last, of course. Now Lucifer’s back, looking a little singed from the flames. Temptation, fall, expulsion: all in about ten minutes’ stage time. We move immediately to the Noah sequence, then the sacrifice of Isaac, then directly to the annunciation. By the interval, we’ve already covered the nativity, slaughter of the innocents, Jesus’ baptism, a few healings and forgivings, and the triumphal entry. The second half of the show focuses on the passion sequence, the resurrection, ascension, and—the big finale—the last judgement (spelled with the extra “e”—this is Britain). So much wonderful spectacle, so many clever touches. The Noah sequence was especially memorable. Poor Noah, called by God to build this big boat. “But I don’t know how!” he protests (I’m paraphrasing). “Oh don’t worry,” God replies, “it’s easy!” And then God rattles off complicated instructions. This is especially funny when you know that this episode was traditionally sponsored by the shipwrights—of course. Soon enough, Noah’s family is ushering animals, two by two, into the quickly assembled ark. Naturally, the zebras carry zebra-striped suitcases. Monkeys, bunnies, flamingos, elephants, giraffes, all of them elaborately and delightfully constructed as costumes or as Lion King-style, human-powered puppets. Meanwhile, Mrs. Noah does not want to go. She declares that God should have consulted her first, and she does not want to leave her “gossips” (lady friends). She’s only convinced, eventually, by a violent roll of thunder. A few scenes later, in the nativity sequence, we have genuine, roughcut Yorkshire shepherds receiving the angel choir’s visitation. In response to the glorious sounds of the angel chorale, the shepherds do their own warbling song and folksy dance, then rush off to see the Christ child. Fortunately, their fluffy sheep sport convenient carrying handles. Somewhat surprisingly, the most terrifying episode in the whole show was the slaughter of the innocents. Herod’s troops, vaguely resembling Huns for some reason, surround a large band of women holding their babies. After some resistance, the soldiers rush in and, amid screaming chaos, literally tear the babies apart, pulling the heads off the plastic dolls and spilling horrid bands of red fabric. The women, in response, group together again and call down rage and condemnation upon the soldiers, banging cowbells and keening, creating a terrible din. And who is at the head of this protest, leading the charge? Anna, of all people, who then transitions immediately into the next episode, the presentation at the temple. Throughout the show, the immense space of the cathedral creates opportunities for transcendent theatrical artistry. A sweeping shimmer of fabric hanging from the “heavens” receives lighting effects at key moments: water, stars, a Roman emblem, a rising ball of light to represent the ascension. The Minster’s stained glass windows, still allowing soft daylight illumination when we begin the show, go dark in time for the passion sequence. The nave ceiling becomes a kaleidoscope of color for Noah’s rainbow. And the sound! Organ and pure voices, reverberating in that holy space: even doubters would catch their breath and wonder about heaven. So all in all: terrific theater. In England, skilled theater professionals seem to sprout on the shrubbery, so it’s not surprising that the organizers were able to assemble a team of award-winning pros with Yorkshire connections to write, compose for, design, and direct the production. Many of the 200 local amateurs in the cast (including 50 kids) had serious theater training even if they aren’t currently working as actors. Musicians are no problem, either. With York’s long history of training young voices, it couldn’t have been difficult to assemble a divine choir of local angels, not to mention a host of grownups who sing well. But what was the point of it all? Can this dense, lively, version of biblical metanarrative still speak to post-Christian Britain? What can it say? Well, it’s clear from the promotional materials that the project was primarily about theater and history, not theology, and certainly not evangelism. The production’s website declares that the show is meant to “celebrate the city’s cultural heritage” and “to provoke tears and laughter and be an intensely moving experience, but above all it’s a once in a generation opportunity to see the city’s most famous stories brought to life in its most iconic building.” Director Phillip Breen remarked in an interview: “We return to these [p]lays again and again because they are asking the most profound questions about who we are, where we are going and what it means to be alive.” Fair enough, though you’d be hard pressed to find a director who wouldn’t make that statement about any play he or she was directing. As a result of this choice to let the medieval script say what it says, though, we’re left with appealing literalizations that create theological distortions. Only God the Father creates the world. Jesus is basically an errand boy who comes to earth, does his job, goes back to Dad. The Holy Spirit? Uh, the dove in the baptism scene maybe? We’ve got a functional Binity here. And I must say, I never really warmed up to Jesus. I don’t think this is a complaint about the performance of Philip McGinley, the one paid professional actor in the show. The script presents a suffering Jesus—scoldy, distant, unconnected emotionally to the people in his story, except to be disappointed in them. Even on the cross, he’s explaining himself. “I just want you all to know I’m doing this willingly!” he more or less points out, prostrate on the still-unlifted cross. What could McGinley do but intone his lines with baritone earnestness? After the resurrection, Jesus goes into angry judge mode, gliding around in flashing white robe with arms upraised at the elbows in classic teaching posture. This is not your evangelical tender boyfriend Jesus. Despite the impressive technical business of the crucifixion scene, I remained unmoved, even skeptical. Meanwhile, to create theatrical conflict with our hero, Lucifer makes for the unsurprisingly more dynamic figure. Played wonderfully by Toby Gordon, Lucifer looks increasingly charred and devilish every time he appears on stage. In the last judgement episode—because a good show requires a concluding swordfight—Lucifer battles the angel Michael, complete with breastplate and “flaming” sword. For the final curtain call, Jesus and Lucifer take their bow together. Drama needs conflict, I know, but we’re edging toward Manichaeism here, yes? Finally, the last judgement scene is a literal enactment of Matthew 25, stopping short of costuming the people as sheep and goats. Jesus from on high rehearses the “inasmuch as you did for the least of these” business, and the crowd of people divides toward their eternal destination. (Ron and I estimated 3/5 to heaven and 2/5 to hell, in case anyone wonders.) Before curtain call, God the Father appears downstage to remind everyone there’s time to repent and be good. It’s true that in the medieval mystery play tradition, literalization of the mysteries is the point and the fun. We want the clichés and we get them. In this production, the audience delighted in the wittier modern instances of this, as when the disciples momentarily create a DaVinci’s Last Supper tableau, or when Jesus’ baptism is staged to look exactly like a famous icon. Such devices can create moving effects, too. I reveled in the gloria choruses, as choir and organ seemed to open the familiar cavern of the Minster like an aperture to another realm. But in post-Christian Britain, what might this literalization convey about Christianity to a public unversed in Scripture or theology? If I were to sum it up, here’s the message: God is almighty though avuncular. Your job is to obey God’s instructions no matter how bizarre, which comes to you from perfectly recognizable angels who stride onto the scene when necessary. Jesus suffered a lot and now judges you. Acts of mercy are the standard upon which you are judged toward your final destiny. Not surprising as popular medieval Christianity, I suppose. But all evening, I kept thinking: These are some of the same subtle distortions that people hold today, both inside and outside the faith. Probably many people in the seats around us and not a few in the cast and crew were church-faithful or at least casual believers. They might be able to nuance these distortions on their own, take it all in good fun and with a historical grain of salt. But what about the uninformed cultural observers? Is this what they can assume Christianity is about? If so, no wonder it seems better to treat Christianity as a “cultural heritage” rather than a live possibility for organizing one’s personal metaphysics in the twenty-first century. I suppose I’m glad we were not subjected to a tiresome effort to present this show as an evangelism tool. That was not its purpose in medieval Christendom, and I doubt it would operate effectively as such today. If you wanted to connect the show in some way to your own personal faith, well, no one is stopping you, but you’re on your own. If not, well, maybe you can take away something about acts of mercy and apply it to Britain’s refugee crisis? Or maybe the Noah story speaks somehow to the environmental crisis? Maybe? Unfortunately, without a supernatural givenness, without an acceptance that all this points to a real, loving God who redeems a fallen humankind, then this charming cultural heritage yields only a kind of banal moralism: Human acts have consequences. Try to be good. What is the enduring heritage of Christianity for Britain today? That question remains unanswered, and it reverberates through this show, through the parishes struggling with declining and aging memberships, through the arguments plaguing the remaining denominations, through the magnificent gothic spaces built centuries ago to testify to the glory of a transcendent, mysterious God. If you found this at all intriguing, I recommend clicking around on the York Mystery Plays site. I especially recommend the nifty time-lapse of building the stage inside the cathedral.